Georges Bourgoignie in the Fort Lauderdale office of Camper & Nicholsons tells me that the 32m Bruce King-designed classic ketch Whitehawk "has been sold to a passionate classic yacht owner and New York Yacht Club member. _Whitehawk _will undergo a substantial refit over the winter in Newport, Rhode Island. 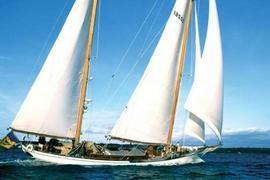 I represented both buyer and seller"
Whitehawk was built by O. Lie-Neilsen in 1978 and refitted in 2008. Accommodating seven guests, her asking price was $2.9 million.